All Saints' Church Northampton - By George, he’s won it! A Little Britten? A Lot of Britten! Our recital today was the fourth in this year’s Lunchtime Live! concert series, ‘A Little Britten’. However, contrary to the title, today’s recital offered a lot of Britten! 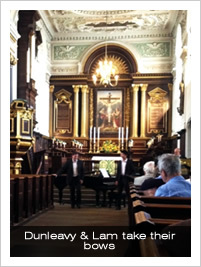 The recital featured the Director of Music at All Saints, Lee Dunleavy, on the piano, alongside the Organ Scholar, Nathan Lam, who played both organ and piano. Despite a catalogue that extends to over 100 works, Benjamin Britten wrote surprisingly little for solo organ; Nathan performed the complete organ works in the recital today. The recital opened with two movements (‘Moderato’ and ‘Nocturne’) from the Sonata Romantica (1940), performed on the piano by Lee Dunleavy. On the Chancel organ, Nathan then performed lesser known organ works: the Voluntary on ‘Tallis’ Lamentation’ (ca. 1940) & the Prelude to “They walk alone” (1938). The fourth item on the programme, the Allegro in D major for solo piano, had not been publicly performed before, and Lee Dunleavy acknowledged profound thanks to the Britten Pears Foundation, and Dr Nicholas Clark, Librarian of the Britten archive, for access to Britten’s manuscripts, making this performance possible. This Allegro was written in March 1932, during Britten’s second year at the Royal College of Music, and anticipates by a few months the distinctive harmonic world of the Sinfonietta that was to become his Opus 1. We then moved back to the organ, where Nathan performed the ‘Village organist’s Piece’ (ca. 1940), before joining Lee at the piano bench for a piano duet arrangement by Howard Ferguson of the ‘Sentimental Sarabande’ from the Simple Symphony (1933/34). Originally scored for string orchestra or string quartet, this arrangement worked surprisingly well, although some of the delicacy of the string version is perhaps lost in this transcription for piano. At this point the programme strayed from Britten slightly, to offer the ‘Adagio in memoriam Benjamin Britten’ (1976), by the German composer Bertold Hummel. Hummel met Benjamin Britten a number of times at various music festivals, and described him as ‘a figure of importance […] for our century.’ Hummel composed his Adagio in memoriam Benjamin Britten immediately on receiving news of Britten’s death, and it was completed by that same evening, 4 December 1976. It is an affecting work, and closes with a brief allusion to Britten’s own Simple Symphony in the final moments. Nathan then moved to the Gallery organ to play his final piece for solo organ, and perhaps the best known the Britten’s organ works, his Prelude and Fugue on a theme of Vittoria (1946). Commissioned by St Matthew’s Church, Northampton, the piece is based on a theme from a motet by the Spanish composer Tomás Luis de Victoria (1548–1611), Ecce sacerdos magnus (“Behold a great priest”), with the theme appearing heavily in the pedals in the Prelude and then taken as the subject for the Fugue. The final set of pieces for solo piano were again works inspired by Benjamin Britten, rather than written by Britten himself, in a set of four short works by Howard Skempton (b. 1947) dedicated to Benjamin Britten. In the sleeve notes to a recent recording of his works, Skempton quotes Britten, who remarked that it was ‘difficult to write simple music with character’. In this set of short miniatures for piano, including the 44-second work ‘Passing Fancy’ for left hand alone, Skempton achieves just that. 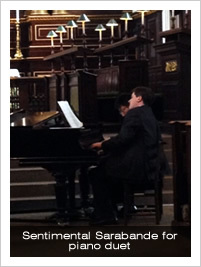 The final work in the recital featured both Nathan, now back on the Chancel organ, and Lee, on the piano. The two musicians came together to perform Britten’s own arrangement of ‘Moonlight’ from Frank Bridge’s symphonic work The Sea, not performed since Britten himself performed it in Lowestoft in 1934. This was a fabulous piece to finish the recital, as the sustained organ chords glistened gently beneath the delicately darting piano, as the moonbeams struggled to pierce through the dark clouds. Eventually the clouds pass away, leaving the sea shimmering in the full moonlight, and a wonderful stillness descends, as both organ and piano gradually move into silence. The audience sat silent for a few minutes, as the tranquil sea scene depicted by Bridge and Britten gradually dissipated once again.